MIAMI–January 31, 2019– A new international study finds that the Atlantic meridional overturning circulation (MOC), a deep-ocean process that plays a key role in regulating Earth’s climate, is primarily driven by cooling waters west of Europe. The study provides the first opportunity to directly link changes in the intensity of the MOC with the processes that drive deep water formation. The findings are important in understanding climate change, said co-author William Johns, professor of ocean sciences at the University of Miami (UM) Rosenstiel School of Marine and Atmospheric Science. “It is critical that we learn more about how changes in the overturning circulation affect heat and carbon storage in the oceans and how these changes might feed back on our future climate,” said Johns who co-led the planning, testing and deployments of the observing system that produced the new data. These findings, unexpected as they may be, can help scientists better predict what changes might occur to the MOC and what the climate impacts of those changes will be, said co-author Susan Lozier, Professor of Earth and Ocean Sciences at Duke University’s Nicholas School of the Environment. “To aid predictions of climate in the years and decades ahead, we need to know where this deep overturning is currently taking place and what is causing it to vary,” said Lozier, who co- led the international observational study. The North Atlantic has the largest reservoir of anthropogenic carbon. Overturning carries vast amounts of this carbon deep into the ocean, helping to slow global warming. It also transports tropical heat northward, meaning any changes to it could have an impact on glaciers and Arctic sea ice. Understanding what is happening, and what may happen in the years to come, is vital. This paper is the first from the $32 million, five-year initial phase of the OSNAP (Overturning in the Subpolar North Atlantic Program) research project, in which scientists have deployed moored instruments and sub-surface floats across the North Atlantic to measure the ocean’s overturning circulation and shed light on the factors that cause it to vary. Lozier is co-lead investigator of the project, which began in 2014. Though the overturning in the Labrador Sea is smaller than the scientists expected, they have learned this basin plays a large role in transporting freshwater from the Arctic and that continued measurements in that basin will be increasingly important, as the Arctic changes unexpectedly. Primary funding came from the U.S. National Science Foundation’s Physical Oceanography Program and the United Kingdom’s Natural Environment Research Council. Additional funding came from the European Union 7th Framework Programme and Horizon 2020. Co-authors hailed from UM Rosenstiel School of Marine and Atmospheric Science; Duke University; the National Oceanography Centre in Southampton, U.K.; Woods Hole Oceanographic Institution; the Scottish Association for Marine Sciences; the Royal Netherlands Institute for Sea Research and Utrecht University; Memorial University in St. John’s, Canada; GEOMAR Helmholtz Centre for Ocean Research in Kiel, Germany; and the Bedford Institute of Oceanography in Dartmouth, Canada. There were also scientists from the University of Oxford; Scripps Institution of Oceanography; the Ocean University of China and Qingdao National Laboratory for Marine Science and Technology; the National Oceanography Center in Liverpool, U.K.; the Laboratoire d’Oceanographie Physique et Spatiale in Plouzané, France; and the University of Liverpool. 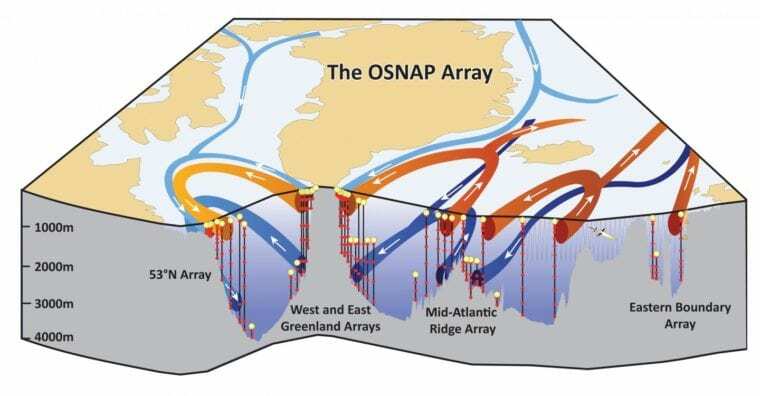 The study, titled “A Sea Change in Our View of Overturning – First Results from the Overturning in the Subpolar North Atlantic Program,” was published Feb. 1, 2019. In Science DOI: 10.1126/science.aau6592. The study’s coauthors include: F. Li, S. Bacon, F. Bahr, A.S. Bower, S.A. Cunningham, M.F. de Jong, L. de Steur, B. DeYoung, J. Fischer, S.F. Gary, N.J.W. Greenan, N.P. Holliday, A. Houk, L. Houpert, M.E. Inall, W.E. Johns, H.L. Johnson, C. Johnson, J. Karstensen, G. Koman, I.A. LeBras, M.S. Lozier, X. Lin, N. Mackay, D.P. Marshall, H. Mercier, M. Oltmanns, R.S. Pickart, A.L. Ramsey, D. Rayner, F. Straneo, V. Thierry, D.J. Torres, R.G. Williams, C. Wilson, J. Yang, I. Yashayaev and J. Zhao. The University of Miami is one of the largest private research institutions in the southeastern United States. The University’s mission is to provide quality education, attract and retain outstanding students, support the faculty and their research, and build an endowment for University initiatives. Founded in the 1940’s, the Rosenstiel School of Marine & Atmospheric Science has grown into one of the world’s premier marine and atmospheric research institutions. Offering dynamic interdisciplinary academics, the Rosenstiel School is dedicated to helping communities to better understand the planet, participating in the establishment of environmental policies, and aiding in the improvement of society and quality of life. For more information, visit: http://www.rsmas.miami.edu.